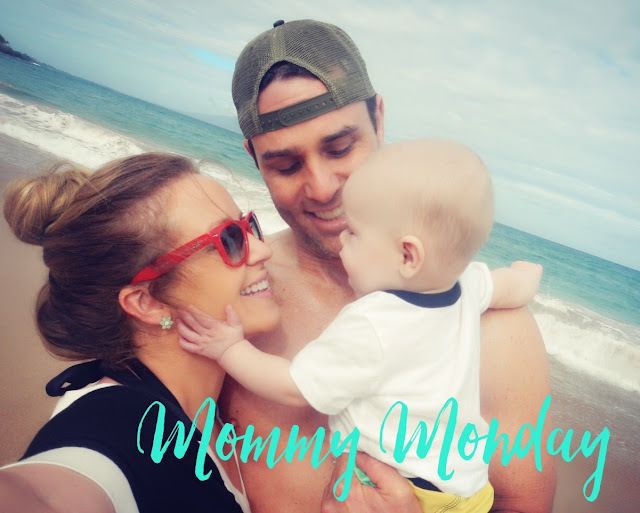 I am so excited to announce that I am going to be hosting a series called Mommy Monday for the next few months! This is a space where women (my amazing friends) will talk about their postpartum experience. The good, the bad and the ugly. I struggled with postpartum depression after Ryder was born (in 2013) and felt so alone. I found a couple blogs written by other mamas who experienced postpartum depression and their words spoke to me! I felt understood. I also felt like I wasn't alone and it helped me heal. I re read their blogs multiple times and found comfort in knowing I wasn't the only one to experience this! Since I started my blog, I have considered writing about my experience many times, but always get too afraid. It's been heavy on my heart lately and I feel lead (for whatever reason) to talk about it now. It sounds cliche, but if just ONE person finds comfort in what is written here, it was worth it. I started to think about how important it is for women to talk openly with each other about this. I remember talking to my doctor after Ryder was born and saying, "WHY doesn't anyone talk about this?!". So now here I am. I'm nervous and going way out of my comfort zone talking about this. So please be kind. :) After I decided I would fight my fears and write about it anyway, I thought it might be AWESOME to have some of my favorite mommy friends post about their experiences as well. This is where the idea of Mommy Monday came from. None of these women are here to offer anything other than their experience and references that helped them. We all have different stories, personalities and experiences. I hope one (or more!) helps you to feel understood and less alone. Oh, and reminders that you aren't INSANE always help, too! ;) So you can check back here every Monday to read blogs written by my sweet friends. So excited to hear all of their hearts! So, my story. I've never dealt with depression before. Just the word: depression. It stings. It feels uncomfortable to even say it. It feels like a weakness, but it ins't! When Ryder was born we had an amazing experience with our hospital and doctors. I LOVE my OB and seriously might have more babies just so I can see her once a month! JK. JK. She is amazing at her job and even though I ended up having an emergency C section (you can read Ryder's birth story HERE) it was very smooth and I felt very cared for throughout my entire stay at the hospital. Tim's mom was in town for two weeks after Ryder was born and that was amazing! Judy is a loving and wonderful mother-in-law! I feel very comfortable being myself around her. She did EVERYTHING for us while she was here. I mean, everything. She cooked, cleaned, did the laundry, took TJ to karate, grocery shopping... everything. I would sit on the couch and nurse Ryder while she served me toast and juice. We'd watch movies together and talk. It was amazing and I was SPOILED by her (and continue to be spoiled by her every time she visits). Ryder was around three weeks old when she left and I think that's when it started to creep up. I never felt sad. Which is why I thought I was fine. I heard my mom or Tim mention "postpartum depression" and I'd get so mad at them for evening thinking I was depressed. "But this is the HAPPIEST I've ever been, mom! I'm so in love and so grateful. I'm NOT DEPRESSSSSSSSEDDDD!!!!!!!" My mom was so gentle and careful to not offend me. And I just couldn't even hear her. I seriously thought her and Tim were being mean! I didn't think they were giving me any room to be hormonal or emotional. I mean, GEEZ. I just had a baby. And a C section! Give me a break! But, they were right. And I wouldn't listen. So, it got worse. I was so overwhelmed. One site referred to postpartum anxiety as "unable to complete normal daily tasks". And that's exactly how I felt. It was BAD, you guys. BAD. I think this was horribly difficult for my husband. Who knew something was up, but didn't know what to do or how to help. I was just WORRIED all. The. Time. About everything. I worried about Ryder not eating at the EXACT time I thought he was supposed to. I was worried about him not sleeping enough, or sleeping too long. I was super OCD about the way the house looked. We had just gotten a new wool rug in our family room. And it was shedding like CRAZY. Seriously, we vacuumed that thing like 2-3 times a day. Ha! But just the thought of that damn rug. OMG. It made my heart race. I was exhausted. And at night, I'd lay there in a panic about him. Worried if he was going to spit up and choke. I'd worry if I heard him making too much noise, or not enough. I'd lay in bed SWEATING having visions of dropping him down the stairs or shutting his little baby hands in the car door. Weird things. I obsessed over random things and COULDN'T LET GO. I sobbed hysterically one night because I ran out of shampoo. Like, SOBBING to the point I was gagging and near throwing up. I remember sitting on the side of the bed crying to my husband and his blank stare. He had no idea what to do. To him I seemed insane. This wasn't the normal me. But to me, I was just SO overwhelmed. Just the thought of taking Ryder to the store to get shampoo stressed me out. I'd worry about him needing to eat while I was out. I'd worry about him crying in the car and me not being able to help him, etc. And you guys, I was just SO freaking tired. All the time. I swear I thought I was going to DIE from tiredness. Seriously. I felt like I was dying. And the anxiety kept me awake at night. I was so worried and my mind was racing, I couldn't fall asleep. My nights looked like this: Feed Ryder. Lay in bed worried. Count the minutes I had left to sleep before I thought he would wake up again to eat. Worry again. Feel tired. Stress out about the DAMN RUG! Check to see if he was breathing. Finally fall asleep... 15 minutes later Ryder would wake up to eat. And repeat. It was a vicious cycle and I was just so, so deeply exhausted. I was in shock to experience this. I had no crazy emotions during my pregnancy. And my pregnancy was fairly easy! I never thought about the fact that postpartum depression could be delayed! I just assumed it was right away. And I just had the assumption that postpartum depression meant sadness or a lack of connection to the baby. Which I did NOT feel. I loved him SO MUCH. I seriously considered eating him a few times (per day). ;) I was so HAPPY to be a mommy to this perfect boy. I couldn't even put him down. I held him ALL. THE. TIME. It literally stressed me out to put him down for even one second. So I learned to pee while holding him, put on makeup while holding him, make myself snacks while holding him. But it wasn't healthy. And I didn't understand that. I didn't know that all mothers weren't holding their newborns 24-7! Why wouldn't they?!? It didn't even cross my mind that this was a little extreme. I remember telling my husband, "I don't even have time to eat! I mean, I'm just starving! But I have no time to eat!" (insert sobbing face). I remember him being really confused and telling me that it was OK to put him down and make myself a sandwich or smoothie. But being away form Ryder for 5+ minutes?! Are you crazy?!?! You guys, this was intense. I avoided peeing because I didn't want to put him down. To the point that I got a UTI. And I ignored it. Which made it worse. When I finally called my OB because I was basically peeing straight BLOOD, she told me I needed to go into the office to get checked out. And I just started SOBBING!!!!!!! The thought of driving down to her office (in Denver) with my newborn baby in the car (who I wouldn't be able to hold for one hour on the way to the office and for another hour on the way home) just stressed me out! I couldn't deal with it. She immediately calmed me down and called in my prescription without having me go in for a visit. Bless her soul!!!! There are so many other experiences and specifics to my story, but I have to cut myself off at some point! I wish that I knew about these things going into pregnancy and delivery. But, I didn't. It was a painful experience and I felt VERY alone. There were times I was so overwhelmed and hurt by my husband. For not loving me perfectly. But he is just one man!!! He was new to all of this, too! He was doing the best he could and we both learned a lot from this experience. If you don't, get a new one! This person is very important and can dramatically change the way you experience pregnancy and delivery. Be open and honest with your doctor about your wishes for delivery (while knowing sometimes there are circumstances that you can't control - aka me having an emergency C section, even though my "birth plan" clearly stated I wanted to have natural delivery). I didn't realize how lucky I got with amazing nurses for both my babies. But I have heard horror stories about mean nurses and... WHAT?! I mean, this is crazy to me. Do not feel bad about asking for a different nurse/s if you for whatever reason feel uncomfortable with the nurse you were given. You have every right to be choosy about this and need to have someone who isn't ruining this experience for you! Don't be afraid to talk to your doctor about drugs. While pregnant and/or nursing. You have to be comfortable with this. But you also have to be sane and mentally healthy for your baby! Anything you can afford to hire out, do it!!! After Ryder was born we decided it was worth it to have house cleaners come and do a big chunk of the work around the house. They change the sheets, too. This takes a huge load off my shoulders and I am forever grateful for this. ANYTHING that you can take off your plate, do. You can have dry cleaning picked up from your front door and delivered once it's cleaned. Order in for dinner. This saves time in the grocery store, time to cook and time to clean the kitchen after! Remember that pregnancy/newborn life is just a phase and you'll get back to cooking, cleaning, etc soon enough. Do NOT feel bad for needing help. It takes a village, people!!! I am also big on hiring sitters. This is mandatory for my mental health. I need to get away. I rarely got away when Ryder was little (until about one year) and I was ok with that. I didn't want or need to leave at that point in my motherhood journey. But once he started walking and getting really busy (plus, I was miserable pregnant!!!!!) I just needed a break. If you can have grandma, grandpa or a sitter you know and trust watch your kid/s for a few hours, do it! It is so refreshing and freeing to know you have time for yourself. Every week. I used to feel REALLY guilty about having a sitter because I don't work. But, HELLLLO!!! I DO work. 24-7. No, I don't make a paycheck for it, but I am raising little humans. It's work. And I don't need to feel guilty for making time to take care of myself. Sometimes I use this time to nap! When you're pregnant and struggling to sleep, or have a newborn baby and you're awake strange hours, never feel guilty for allowing yourself time to rest. I'd like to say sometimes I use my sitter hours to go to the gym, but I totally don't! LOL I try to do something I enjoy. I'll get a mani, see the chiropractor or meet a girlfriend for lunch. Something along those lines. Or I'll go to Target. Alone. AHHHH the joys of going to Target without kids! If you don't have family in town who can help for free, and you aren't in a position to hire weekly help, trade! Hosting traded playdates is a win-win. The kids are usually so entertained and distracted by each other, it kinda makes your day easier. Well, sometimes. Ha! And then you and your friend can swap days and each have some free time to do whatever it is that gives you a MUCH deserved break. If your husband is willing, take shifts with night feedings. This way you can each get at least a 5 hour stretch of Zzz's. Even now, Tim takes the morning shift. Blakely sleeps through the night, but she wakes up early. Tim is a morning person (I'll never understand you morning people!!) and is always willing to let me sleep another two hours and give Blakely a bottle. Sleep is crucial and the GLUE to our family! Tim and I have seen a counselor our entire relationship. It's just nice to have a referee who can guide you in your marriage. Marriage is tough!! And then add some kids to the mix. It's a lot. Having a professional on your side when your in a deep, dark pit is always a good thing! Even when we're doing really well, we still go in for maintenance. Sometimes we feel like we have nothing to talk about but then go and have a great session. Having this in our marriage has been a huge help to us! Budget in the things you NEED in this difficult phase of life. Whether it's a sitter, a counseling session, eating out more for dinner, etc. If you plan for it, you can make it work! I know we all have different financial situations, but I trust in your ability to be resourceful here! I have my opinions and views of what I think is best for my babies/family. But those are MY views. I would never expect my friends to fully agree with me and raise their children the same way! Why are we shaming one another?! If you co-sleep or sleep train, breast feed or formula feed, do time-outs or believe time-outs are horrible, spank or don't spank... whatever, IT'S OK! You have no one to answer to. I think a lot of parenting is just survival!!!! We have to be comfortable with the fact that no matter what we do as parents, someone is going to think we're doing it perfectly, while others think we're doing it all wrong. But that's ok. We can do things differently and still respect each other. YOU are the mommy. YOU were given this baby form God, who trust you. He trusts you to raise this child/children the way you feel is best. Listen to your gut. And LOVE on those babies! Having a friend (or a few) who "get you" is so important. I am blessed with many friends who I know have my back. I can call them SCREAMING in anger or CRYING in fear and they are always there. No judgement. Just love and grace. Please, please reach out to friends for help when it's needed. I'll never forget texting a couple of my close girlfriends when Ryder was really little. I was in a very dark place in my marriage and struggling with my anxiety. Within an hour they both showed up with food, dessert and open hearts. When they walked through the door I could barely believe my eyes! I never asked them to come over. They just did. They talked with me and made me feel understood and offered support. They watched Ryder while I showered and once did a couple loads of laundry! I mean... Is that not the most amazing thing!? I'll never forget that and I'm getting teary eyed just thinking about it. I felt so loved and it immediately put me in a better place! I sincerely hope this helps someone out there who may be struggling with similar emotions post baby. This phase of life is sooooo beautiful and so hard. SO, so hard. We are tired and never feel like we're doing enough, no matter how much we do for our family! But I hope you hear me when I say YOU'RE AWESOME!!!! And you (yeah, YOU!) are doing a GREAT JOB!!!! No one will ever love those kids the way you do, Mama! Thank you all so much for being here. I appreciate each and every one of you SO much. You can read more about postpartum depression and anxiety HERE. Hey Bethany! Thank you so much! Wishing you a smooth transition! The love is overwhelming. :):) So excited for you! Thank you for sharing your story! You're brave and you did an awesome job.